Parkour and free running is a new sport that Popular in this era, is the physical discipline of training to overcome any obstacle within one's path by adapting one's movements to the environment. It is a non-competitive, physical discipline of french origin in which participants run along a route, attempting to negotiate obstacles in the most efficient way possible, using only their bodies. Skills such as jumping, climbing, vaulting, rolling and swinging are employed. Parkour can be practiced anywhere, but areas dense with obstacles are preferable, and it is most commonly practiced in urban areas. We can look the action of parkour sport on movies and news, like yamakasi, etc. As we know Parkour is a dangerous sport, but it's also a Unique and fun sport. 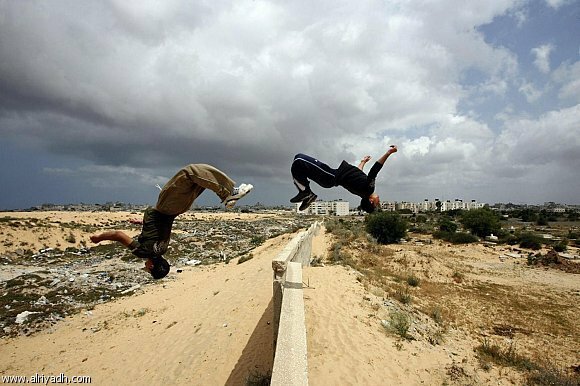 Many young people in any countries love this sport called parkour, no exception youth boys who live in gaza strip also like this sport. Now Muhammad, Abdullah and gaza children also had clever play this sport, they aspire to be successful like other great players and out of this blockade, we hope that what they aspire can be realized, amen. 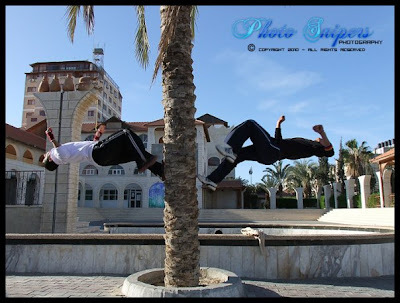 Keep Spirit Gaza Parkour, we are always support you all ! !